WELCOME TO ZION PARENTING!! – ZION KIDS: LESSONS FOR THE PARENTS is a moving collection of 2 DVD lessons from Gwen Shamblin that are centered on raising children to wholeheartedly love and obey the Father! 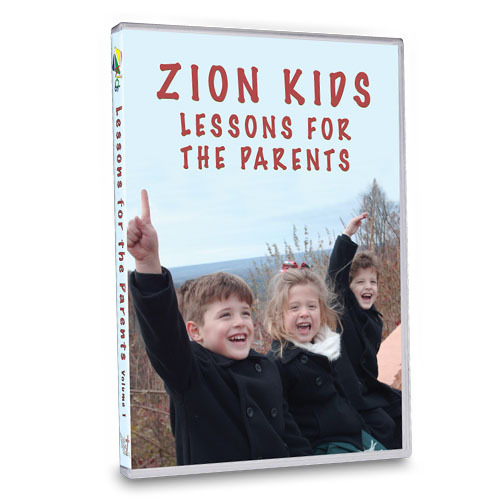 This special ZION KIDS: PARENTS collection includes 2 DVD lessons of life-changing principles that will change the way you look at your life and your children's life. Get practical advice on how to help your children connect everything to a relationship with God. These principles are for children of any age and will be invaluable tools on raising your children to love God with a whole heart. Zion Parents, as well as the entire Zion Kids collection, was written and produced by Gwen Shamblin with Weigh Down Ministries and Remnant Fellowship Churches. Zion Kids is a series of videos that will transform the whole household, for it is full of God’s music and knowledge of God and worship to Him. The lessons in Zion Kids have been changing families for the better as every age group has been learning to love God and trust Him more and more. ZION PARENTS will continue to guide your family down the path of true change as you learn fruitful parenting strategies straight from God’s Word and His examples. Gwen Shamblin used these principles based on the Bible’s mere-Christianity message in raising her own children, Michael and Elizabeth, and she has seen the need for these fundamental principles to be passed on to others being raised in this day and age. We know now by the grace of God that the reason for living is to love God with all our hearts! This is what will bring true peace, joy and happiness! We have an incredible opportunity to get out of ourselves and onto the focus and praise of God, while learning to help others--simple, but profound. We do understand that raising children can sometimes be a challenge, and if you need help please call us at Weigh Down or Remnant Fellowship churches for support and encouragement..